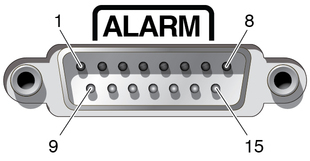 The alarm port on the rear panel uses a standard DB-15 connector that provides a connection for a Telco dry alarm relay cable. In a telecommunications environment, use this port to connect to the central office alarming system. The alarm port relay contacts are rated for 100V, 0.2A maximum.